Mandara products I have seen over the years in Sainsbury's. I've even purchased for gifts for family especially during the Christmas period, you get nice little sets. Today I'm going to share my opinion on the brand after personally using for nearly a month. I use the Mandara Spa Bali Santi Indulgent Bath & Shower Cream, after I've mainly cleansed with a soap to give a little moisture back into the skin. It's very soft and has a mild lather. The scent is prominent but not overbearing, you can smell that coconut blend. You can also use this in the bath, just run under the hot water and let it bubble up, I always put my hand in the bath and swoosh around regardless for more bubbles. Although I've used this more in the shower than the bath. What I like even though you'll read the ingredients and see SLS, don't discourage it's not sodium lauryl sulfate. It's sodium lauroyl sarcosinate it's a suffocant but mild and effective, doesn't doesn't corrode, irritate & more like sodium lauryl sulfate. Finding a foot butter that's nourishing and aides in healing dryness or cracks is important, I tried the Mandara Spa Citrus & Coconut Foot Butter, it's soft on the skin and leaves the foot fairly moisturised. I've found it works best on the days after I've done my weekly foot routine i.e. foot soak and dead skin removal. This cream is good to use on the days afterwards when the skin on my feet doesn't need heavy duty cream. I'm always searching for that Jennifer Lopez glow! Mandara Spa Bali Santi Glistening Body Oil, has coconut oil, sweet almond oil and vitamin E oil. Dry body oil normally leaves the skin with a demi-matte finish and non greasy, so I wouldn't classify this as a dry body oil it's a light oil with small glitter pieces running through that when run over the skin, you'll get a nice glow with light picking up the flecks of gold. When you run your hands over the skin, it's smooth and hydrated, you just need to shake it up before use as the glitter settles, pour into your hand and run it over your body wherever you'd like to glisten. I love to keep a hand cream around whether on my desk or in my handbag, Mandara Spa Shea & Coconut Hand Butter is sooo soft and nourishing for my hand as well as cuticles. There's almond oil, cocoa butter, coconut oil and also glycerine which helps to lock in the moisture something that we need in these cold weather months. Overall what can I say the products aren't bad at all. I normally don't give products to people that I've never tried before but it seems in this instance I was lucky with taking my chances. 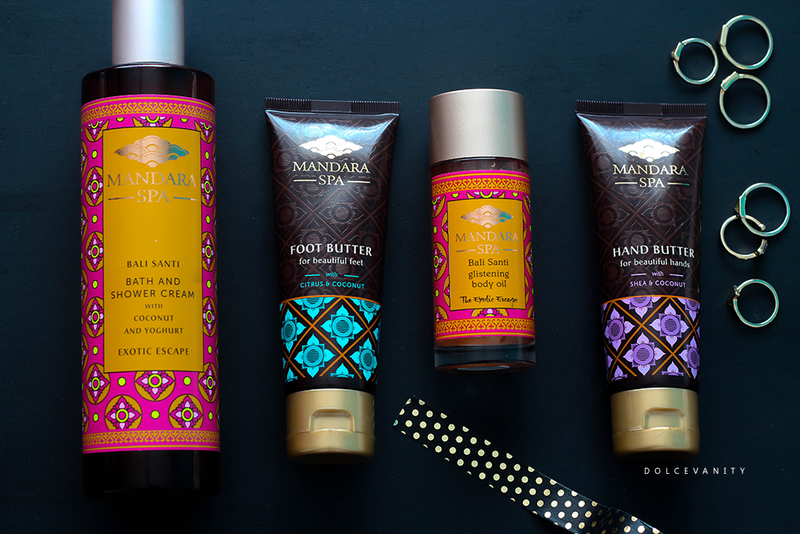 All these Mandara Spa products are under £10 each. You can find these online at Time To Spa and in-store in Sainsbury's nationwide.